When Kathie and I purchased (in 1980) the property that has now become Pleasant Valley Conservancy, we were not aware of its potential value as a natural area. Even when we started restoration work (in 1995) we had only a glimmer of understanding of its value. As work continued, we began to realize more and more the value of the site. A major reason was because of the appreciation we developed for the large open-grown bur oaks that were the main occupiers of the south-facing slope and the ridge top. In 1997 a large bur oak on the ridge top came down in a storm. A neighbor cut a slice from the stump, and we found that this tree was 200 years old. Start date 1797. In years 2010-2012 we marked every tree on the Conservancy over 10" in diameter with a permanent marker, and recorded its GPS coordinates and species. Using GIS software, I have mapped every recorded tree. Some of the data can be seen on the PVC website. 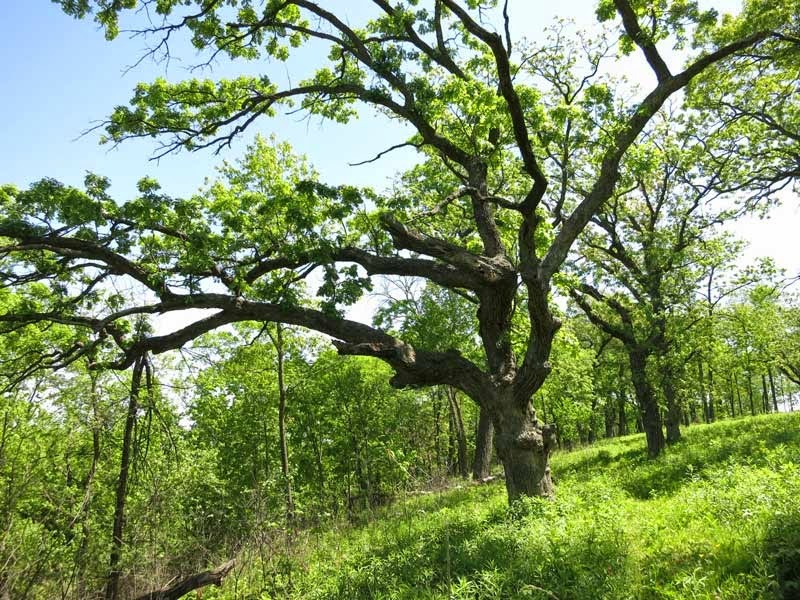 In 2013 researchers from the TREES laboratory at UW-Platteville cored 10 large bur oaks scattered across the ridge top, as part of a major dendrochronological study. The table summarizes the data. The location of each Unit # can be found on the Management Map available on the PVC website. Although the researchers attempted to core older trees, they only had time for a short visit. Possibly there are older trees elsewhere on the Conservancy? How many pre-Revolutionary War trees are there at PVC? The oldest tree (#2365) is shown in the photo below. This tree is very easy to see from the main service road. In fact, a number of photographers have been attracted to this tree because of its interesting shape and large trunk. It is adjacent to the North Firebreak. As the photo shows, it is just at the top of the steep slope that leads into the North Woods. Thus, this tree is at the transition between oak savanna and oak woodland. It is interesting to imagine what the situation was like when this tree first began in 1735. There must have been bur oaks at that time, providing acorns for the new trees. How many years has an oak forest been present at this site? At least several thousand years? This is a question that paleoclimatological research can probably answer. We've been visiting the Driftless area of western Dane county for many years but it has only been in the last dozen years that we have been seeing turkey vultures. Having lived in southern Indiana where vultures are very common, my first siting in Wisconsin was something of an event. Now I see them all the time, especially soaring over our steep south-facing slopes. My experience is not unique. According to Mossman and Hartman, there has been a dramatic increase in vultures in Wisconsin since the 1970's, especially in the western part of the state. Mossman, M.J. and Hartman, L.M. 1992. Turkey vulture nest records from Wisconsin. The Passenger Pigeon, Volume 54: 31-42. Vultures are scavengers and cruise over an area looking for road-kill or other carrion. We often see four or more, flying low and nearby and gradually working their way up on the thermals until they are so high that you can hardly see them. Their eyesight is superb, so they can spot carrion from high in the air. Their sense of smell is also outstanding. With their huge wings, they can fly in almost any wind. Yesterday's strong westerly was no problem and I saw them most of the day, often quite low. Late in the afternoon I saw four birds over the south slope. They gradually rose as they circled on the wind and once they were high each bird went its separate way. According to Mossman and Hartman, turkey vultures nest throughout Wisconsin. Many of the nest sites are on the ground among rock outcrops. Although we have no confirmed nesting at Pleasant Valley Conservancy, we have plenty of rock outcrops that would be suitable. Aspen is one of those plant species that you can either love or hate! It has extensive commercial value, and its fall color is greatly prized in the Rockies. But it forms large (often huge) clones which make it a menace in prairie and savanna restoration. The individual trees of the clone are connected by rhizomes, which also are responsible for the spread of the clone into new territory. Unfortunately, aspen cannot be removed by simple cutting, since there are massive numbers of underground buds which are then released from dormancy and send up shoots. Cutting an aspen clone turns a site with a few dozen trees into a forest with hundreds (or thousands) of shoots, each arising from one of those dormant buds. The only way to remove an aspen clone is to girdle every tree. Girdling starves the roots of energy and nutrients and the roots eventually die. It may take two years for the girdled trees to die, after which they can be cut and removed. For details of how girdling works, see this link. Unfortunately, not all the buried roots die. Some of these roots containing underground buds apparently survive and escape dormancy, sending up shoots. How long will these underground roots survive? I used to think "just a few years" but our experience at Black Earth Rettenmund Prairie indicates otherwise. What is the situation? At the time the Nature Conservancy acquired Black Earth Rettenmund Prairie in 1986 (29 years ago) there was a fairly large aspen clone along the north edge of the Saddle area. This clone was removed by the conventional girdling procedure and by 1990 was completely gone. In 2002 Kathie and I took over management of BE Prairie. In 2005 we found that a large number of aspen shoots had arisen in this area. Using hand clippers and glyphosate, volunteers cut and treated all these shoots. After that we began burning the Saddle almost every year, either with the North or South unit. This year (2015) was the first time in some years that we left the Saddle unburned. By early May a large number of new aspen shoots had developed which had obviously arisen from viable dormant buds associated with buried rhizomes. 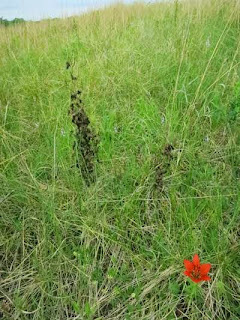 In earlier years, when the Saddle was burned, any new shoots that had developed during the growing season would have been top-killed by the next spring's burn. But this year by allowing a second year of growth, these aspen shoots were now fairly large and easily visible. My conclusion is that the new shoots have arisen from dormant buds that have remained alive since the aspen clone was eliminated in 1986-1987. Even remaining in the dark all these years, those buds have remained alive. How long will they yet remain alive? Only time will tell, although I would bet they still have a long underground life yet! Two aspen shoots treated 5 days before. The wood lily is undamaged. What is the best way of eliminating these new aspen shoots? Since 2005 we have developed a much better and more efficient technique. These young aspen shoots are very sensitive to basal bark treatment with 20% Garlon 4 in oil. Our preferred application method is a sponge on the end of a wooden stick or PVC pipe. The sponge is kept soaked with herbicide from a spray bottle, and treatment consists of swiping up from the bottom along one side of the shoot for a distance of about 6". With this procedure there is no peripheral damage to other "good" species, and within 5 days the treated aspen shoot looks very moribund. Follow-up observations showed that no later new regrowth occurs at the bases of treated shoots. Each treated shoot is gone for good. Aspen shoots basal barked 5 days before with 20% Garlon 4 in oil. Other species are unharmed. Trillium grandiflorum carpet in our oak woods. 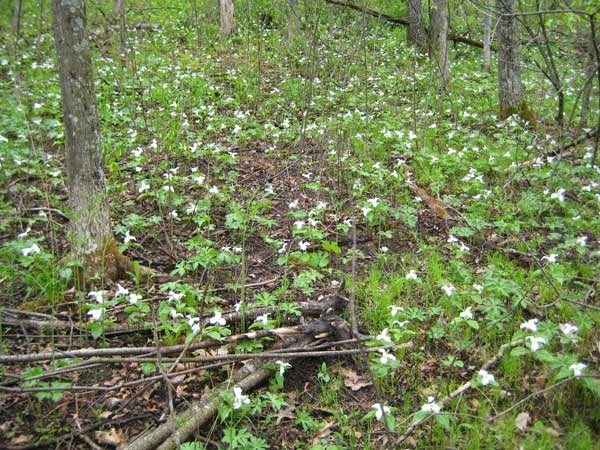 This is the time of year for Trilliums. We have scattered flowering plants in the oak savannas, but the major display is in the north woods, easily visible by driving slowly along County F.
This year the display is larger than we have ever seen it. It extends along almost a half mile of the lower area of woods. I attribute this large display to the successful woods burns we have had the past 10 years, including last October. As a result of the last burn, the carpet of oak leaves was removed, making it easier for the plants to send up shoots. We burn these woods in the fall partly to keep from damaging the spring ephemerals. A spring burn in these woods would have a detrimental effect, since it would kill the new shoots. In the fall the Trillium perennating structures lie deep under the soil where the fire cannot reach them. Through the years that we have been doing restoration work at Pleasant Valley Conservancy, we have seen the Trillium carpet continue to spread. Trillium grandiflorum forms short tuber-like rhizomes, which participate in its gradual spread. Seeds are also formed, and are spread by ants. According to some sources, seeds are also dispersed by yellow jackets, other flying insects, and white-tailed deer, which may explain why we find isolated plants scattered through our ridge-top savannas, a long way from the woodland carpet. We get quite a few birders at Pleasant Valley Conservancy, and most of them comment on our red-headed woodpeckers (Melanerpes erythrocephalus). This is a bird species that is in decline in much of its historic geographic range, including Wisconsin. Research has shown that this species benefits greatly by oak savanna restoration See: Brawn, Jeffrey D. 2006. Effects of restoring oak savannas on bird communities and populations. Conservation Biology Volume 20 (Issue 2; April), pp. 460-469. 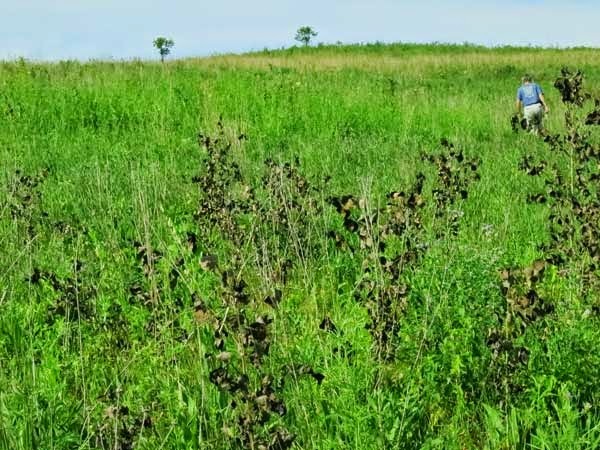 In fact, we saw our first red-heads here shortly after we had done the initial restoration on the ridge-top bur oak savannas (Units 10 and 11). They definitely breed here, and most years they remain here throughout the year. They almost always turn up in our Christmas bird count. 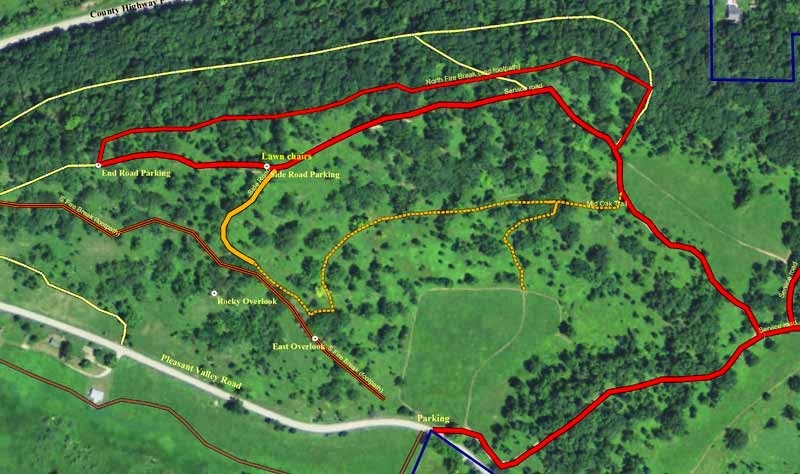 The map below shows the best area to see red-headed woodpeckers at Pleasant Valley. The two lawn chairs (labeled on the map) make a convenient viewing site. Why are red-headed woodpeckers declining? Research by William Mueller (Master's thesis, U.W. Milwaukee, May 2002: The biogeography and recent decline of the red-headed woodpecker in Wisconsin.) has shown that the principal factor is habitat loss, including loss of nesting sites and foraging areas. 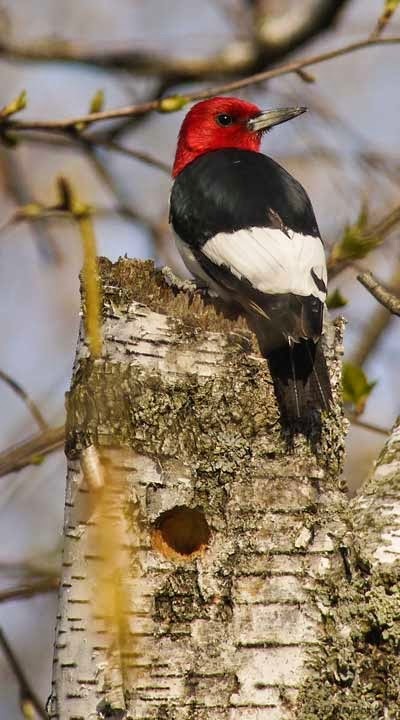 Mueller also notes that there is evidence that oak savanna restoration and prescribed burning have a beneficial effect on red-headed woodpecker populations by providing optimum nesting and foraging habitat. Preservation of snags is especially beneficial. Violets are blooming now in the prairies and are close to their peak. 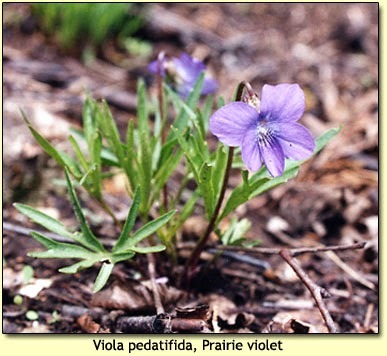 There are two species of violets found in prairies. 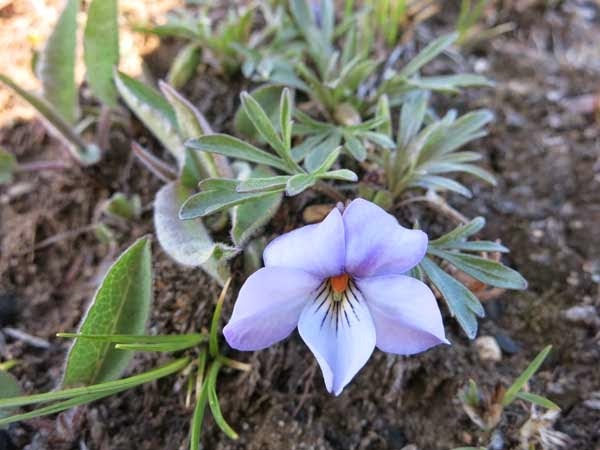 The one that tends to form patches is birdfoot violet, Viola pedata. The other species, prairie violet, Viola pedatifida, is generally more scattered. Both can be seen now at Black Earth Rettenmund Prairie and Pleasant Valley Conservancy. Right now there is a large display of birdfoot violet on the south slope of Pleasant Valley Conservancy, best reached by the trail up from the corner of Pleasant Valley Road and County F.
Don't be confused by the more common violets, such as those found in lawns and weed patches or in woods, whose leaves are whole (undissected). A great prairie to see large displays of violets is the Nature Conservancy's Spring Green Preserve, along Jones Road off Wisconsin 23, just north of Spring Green, Wisconsin.